I am amazed at what is available online today. Documents I would have never thought to look for 10 years ago are now readily accessible online. In my Burlison Project, I was seeking to know more about Bertha Mariam White Burlison Gardner. I knew she lived in Oklahoma County, Oklahoma much of her life. I did a Google search for: Oklahoma County Clerk. I then found they have a searchable database of documents in their “ROAM” system. I searched for Bertha Burlison and found three documents. The first one was warranty deed where she bought her house on Angel Drive in 1974. Later in 1974, there was an antenuptial agreement between Bertha and Jack Gardner wherein they agreed they would keep any property they have before the marriage as individuals, particularly citing Bertha’s home. I found it very interesting to note that the notary for the document was Bertha’s son, Larry. Apparently, they wanted to make sure that Bertha kept the house in the event that Bertha and Jack’s marriage didn’t work out. Apparently, that concern didn’t last long. Only six years later (1980) a warranty deed was signed by Bertha wherein she sold ½ of the property to Jack making him a joint tenant and giving him full survivorship rights to the property. Besides learning a little about the family dynamics, I also learned that Bertha and Jack were married sometime after 17 Jun 1974 and before 10 Dec 1980, probably close to June 1974. Bertha Mariam White was born on 2 April 1926, the sixth of eleven children of Eugene W. and Ruthie Lee (Dodd) White in Blanchard, McClain County Oklahoma. The 1930 census shows the young Bertha living with her Father, mother, seven siblings, and her paternal grandmother, Georgia A. Shipley (White) in nearby Goldsby. According to the 1940 census, in 1935 the family was living in the same place, not the same house, as they lived in 1940. The 1940 census indicates 14-year-old Bertha living with her father, mother, seven siblings. Also living with them was her oldest sister’s husband in Victor Township, McClain county, Oklahoma. I had a difficult time figuring out exactly where Victor Township is. Google doesn’t show it. Mapquest shows a Victor, OK that is far away from McClain county. After some effort, I was able to find a map that showed where it was and then I could apply it to a more detailed map. 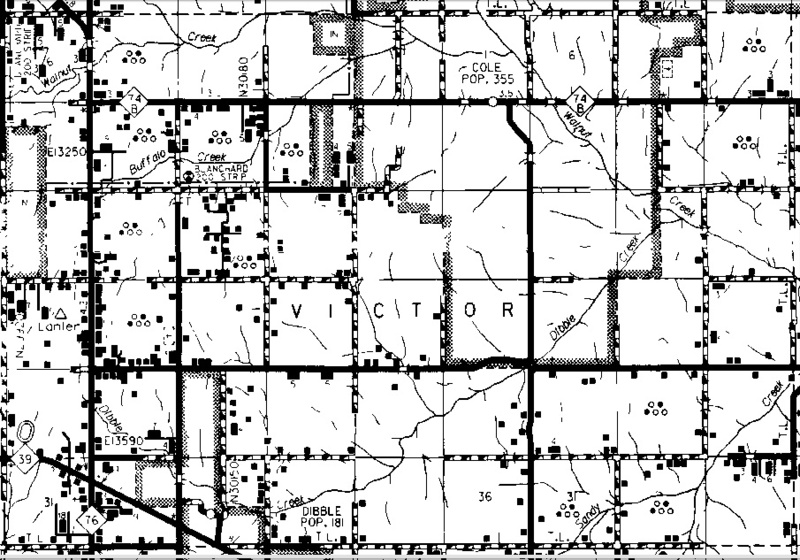 Victor Township is a larger than typical townDship 9×6 miles square (most townships are 6×6 miles square) that includes the towns of Dibble, Blanchard, and Cole. 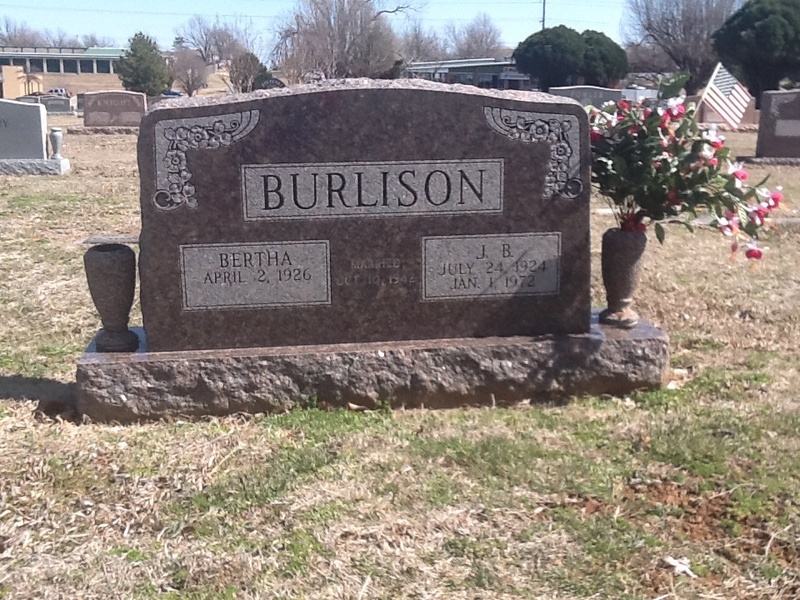 Bertha married J.B. Burlison on 10 October 1942 in Dibble, OK. The ceremony was performed by Rev. Clay Richey who was the minister at Free Will Baptist Church. The marriage witnesses were Mr. & Mrs. H. H. Burlison (presumably J.B.’s oldest brother, Haskel Hollis Burlison and his wife). Their first son, Larry Dean was born 26 September 1943 in Blanchard, OK. They must have moved to Texas for a while because their second son was born there in 1951. She would have two more children for a total of four boys. We lose track of J.B. and Bertha until 1955 when they appear in an Oklahoma city directory living at 2826 SW 43rd. J.B. is a driver for Transcon Lines. They had moved to 3612 SE 15th, Del City before J.B. died in an auto accident New Year’s morning 1972. He and Bertha had been married 29 years at the time of his death. J.B. is buried at Sunny Lane Cemetery in Del City, OK.
Before 1974, Bertha bought a home at 4013 Angela Drive, Del City. Because in June of 1974 Bertha and her perspective husband signed an antenuptial agreement protecting her house from her new husband, Jack Earl Gardner, Jr. I don’t know exactly when they were married, but certainly sometime in 1974. In 1980, Bertha signed a warranty deed making them joint tenants of the house at 4013 Angela Drive giving Jack full rights of survivorship. Family history indicates that the house on Angela Drive was destroyed in a tornado in 1999. On 2 July 2000 Jack died. They had been married for 26 years. Jack Earl Gardner, Jr. is buried at Sunny Lane Cemetery in Del City, OK. In September 2008, her oldest child, Larry died. Bertha Mariam Gardner died on 5 November 2013. Services for her were held at Bill Eisenhour Southeast Chapel. Her obituary says she was to be buried in Sunny Lane Cemetery; however, I am not sure where. The marker for her first husband has her name and birthdate on it but has not been inscribed with a death date. Her second husband’s marker doesn’t indicate anything. So, I need to contact the cemetery and see if their records indicate exactly where Bertha is buried, with her first husband without updating the marker or she may be buried elsewhere in the cemetery. Always check for County Record repositories. They can provide invaluable information. Determine exact date for Bertha and Jack’s marriage. Determine Bertha’s burial location within Sunny Lane Cemetery. The missing time was spent in west texas oilfields. Along with my parents. my father was her brother. My mom and she were in school together. 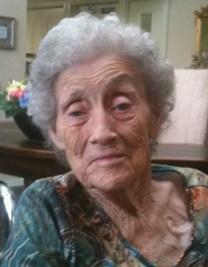 And friends .of my moms sister in laws bert was her friend and favorite I am much younger than Bert’s children. Her kids were my sisters age.